In an affidavit pertaining to the Sethusamudram project, the Central government told the Supreme Court that there was no historical evidence to establish the existence of Lord Rama or the other characters in Ramayana. The affidavit was filed by the Archaeological Survey of India (ASI), an organization under the Ministry of Culture, whose goal is to conduct archaeological research and protect India’s cultural heritage. This caused an arc of outrage and a political crisis. To control the political damage, the Congress-led United Progressive Alliance (UPA) government withdrew the affidavit and suspended the concerned ASI officials. This makes sense, not so much for shielding the Minister for Culture, but for making unwarranted statements about the historicity of Rama. 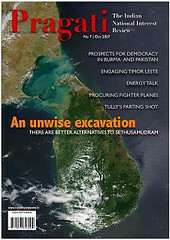 Read the rest at the October 2007 (Community Edition) of Pragati. The Community Edition of Pragati is available for free download and this edition may be freely distributed (in its complete form) via both electronic and non-electronic means. You are encouraged to share your copy with your local community or social networks. Congrats! You’re now an officially a writer. I wish I could write as well as you, alas I don’t have the time anymore. Interesting article on the neighbourhoods of Chennai in the millennia gone by. Great article…I will probably upload the Pragati issue on my Box.net account.